It seems to me a very silly idea for me to try to think of anything impressive to say about a classic like The Man in the Iron Mask . I am not a scholar, just an enthusiastic and frequently unintelligent reader. Because there's not much I could say that has not already been said, this post will likely only be interesting to myself as I'm noting the fact that I read this book in 2012. Still, I am very glad that she agreed to read it "with" me for the same reason that I'm glad She Who Shall Not Be Named (only because I'm not sure if she wants to be) chose Bleak House for my local book club. Classics are much easier to read alongside friends. It makes the challenge sweeter somehow. At the very least, it makes you finish the book to either a.) win the reading race or b.) save face when they finish the book before you do. 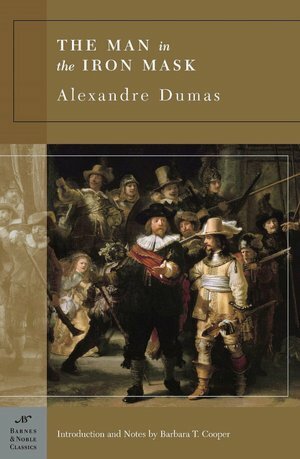 Secondly, I should note that I discovered when reading this one (through yet another book lovin' friend) that The Man in the Iron Mask is the last story in a series by Dumas. I was somewhat pleased to discover that this was news to Sarah as well, who would have preferred, like I would have, to have started at the beginning. But then I was shamed again when I asked Jonathan if he was aware of this and he started his lengthy answer with, "Oh, yeah . . . "
So exactly which books should you purchase (or check out at your local library) to make sure you read the whole story in order without overlap or accidentally leaving something out? Can someone shed some light on how these books are best approached? I assume it really is a trilogy but then would you pick up Ten Years After and expect it to include the "bit" about Iron Mask or has it officially been split? Fourthly, I found Dumas to be incredibly witty and I loved his characters. He brought more than one smirk to my face with his dialogue between the characters. Favorite character: Porthos. He gained my sympathy with his simple Wodehousian mannerisms and manner of speech. But in the end, he was all heart and I admired him for his dumb loyalty and many, varied suit collection. d'Artagnan of course has my admiration for his quick and cunning manner and deep respect for honor. In fact, I loved the theme of honor which plays heavily into the entire storyline and I would peg this as a great book for young men to read, in particular. Least favorite character: Raul. I have little sympathy for someone - anyone- who moons about after a lost love. Pick yourself up off the floor, man, and live! He annoyed me. Endlessly. Fifthly - The book isn't at all like the movie!!! ;) So I'm glad I read it. I had no idea it was a series either. I've had Three Musketeers on my want to read list forever. Guess I should get to it. I knew The Man in the Iron Mask came after The Three Musketeers and the musketeers appeared in iron Mask, but I didn't realize there were more books in between. I read both of those years ago, having seen film versions first, and the books seemed a lot darker to me. I remember being very disappointed at the ending of Iron Mask, which was different from either film version I had seen. I wish I had read the books first -- I might have liked them better. I should probably read them again some time, but like you say, they are a lot of work. :-) Maybe some day. I liked The Count of Monte Cristo by Dumas much better than his other books. I have enjoyed almost every Dumas novel that I have read (which is only 3, I think), and this one is definitely on my TBR list! Thanks for clarifying the confusing book order, as I would prefer to read them in order, too. Like others, I highly recommend The Count of Monte Cristo, and the unabridged version really isn't so bad, though it looks daunting. As you've learned, Dumas has such vivid characters and action that the pages go by very quickly - much more quickly than, say, 50 pages of description on French sewers (though I do love Les Mis, too)! I have read The Count of Monte Cristo . . . years ago . . . at the request of my husband. And I loved it. Maybe it's like the Hitchhiker's Guide to the Galaxy Trilogy. There are five books in it. I have read all of those, but so far apart in time that I guess I didn't realize till, a few seconds ago when I read your blog, that they were all one story. That's annoying! Now I kind of feel like I need to start over. I went through a giant Dumas phase in my late teens, and I own a lot of his books. He is hilarious and it's very unexpected. Well thank you for enlightening me. :) I did not know that there was a whole series. I picked up The Man in the Iron Mask used (it was rudely cheap for being a classic) and I've been wanting to read it, but now I think I'll have to read the series in order. I love Dumas. I've read The Three Musketeers and The Count of Monte Cristo. I think next year I'll tackle the rest of the Musketeer books. Have you seen the 1998 version of The Count of Monte Cristo? It stars Gérard Depardieu and is extremely well done.